But at the workplace, it can seem like a luxury. Some employers may choose to limit internet accessibility to protect their workers from downloading viruses or causing their computers to be vulnerable to hackers. They may also believe that limited access could prevent employees from web surfing when they should be more productive. On the face of things, this may seem like a good plan. But it could send the message that employees can’t be trusted, lowering morale, says Sebastian Schuetz, Walton College information systems assistant professor. He says employers should consider being less restrictive with internet accessibility and make their employees more accountable. “If you feel people can act responsibly, they will take you up on that,” he says. Internet security policies in the workplace has been a good source of research for Sebastian. He explores how institutions can better engage their employees to practice safe habits while online. “I feel like security is an interesting field because it is a persistent need,” he says. My first job was: research assistant during my undergraduate studies. The best time of day is: morning and evening hours. My favorite board game is: Settlers of Catan. A movie I would recommend is: The Intouchables. 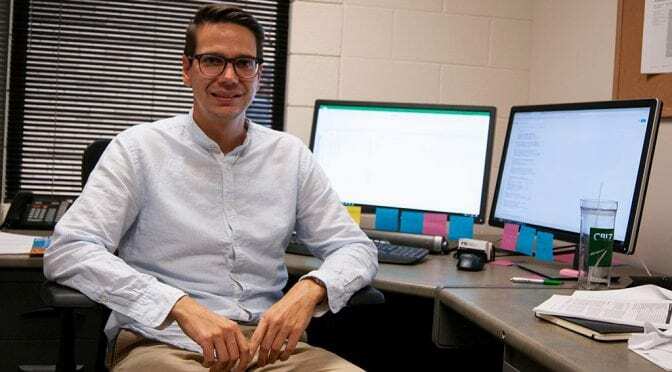 Sebastian, who joined Walton faculty in 2017, teaches graduates and undergraduates Enterprise Resource Planning (ERP) Fundamentals, where they learn about business management software and database applications. His exposure to computers began as a child in his hometown of Stuttgart, Germany. His older brother owned a Commodore 64. Sebastian used it to play games and, later, to try his hand at programming, which eventually led to an interest in computer security. He earned both his bachelor’s and master’s degrees in business informatics at the University of Mannheim in Mannheim, Baden-Württemberg, Germany. As Sebastian was completing his Ph.D. in information systems at City University of Hong Kong in Hong Kong, he sought work in the United States, a place he had seen only through American television programs shown in his country. His first extended stay in the United States was his trip to Northwest Arkansas. Sebastian says he enjoys the Southern hospitality of Arkansas, including the occasional “howdy!” as he walks down Dickson Street. He considers his Walton colleagues his friends. He says his students at Walton are eager to learn and don’t take their education for granted – they engage their professors. Sebastian also receives emails from former students who tell him they have applied to their new jobs what they have learned in his classes. Sebastian says people with the University of Arkansas are very welcoming. He’s settling in well.